My daughter LOVES art - she would spend all day drawing or painting if she could. I, on the other hand, am not very artsy and don't really like the mess. But, knowing how much my daughter thrives on anything art related we make time to add it to our schedule. And now that she's getting older, we've begun expanding our art horizons with some cool projects and tools. 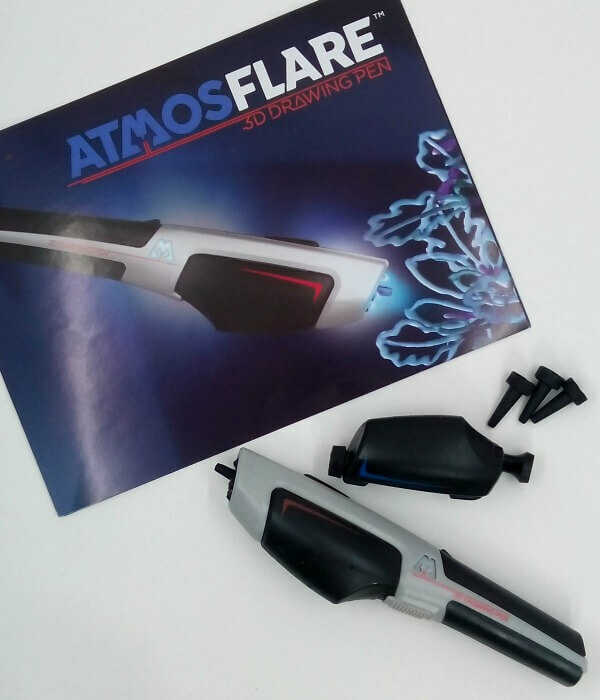 Our latest find is the AtmosFlare 3D Pen - a must for crafty kids (and budget-conscious moms)! It's the perfect tool for learning about abstract art - and creating your own abstract sculptures. Disclaimer: I received a free AtmosFlare 3D pen in exchange for an honest review. I was compensated for my time spent using the product and writing this post. I was not required to write a positive review. All opinions expressed are my own. I am disclosing this in accordance with the FTC Regulations. I don't know much about famous paintings or how to critique artwork, even less when it's abstract art, but I'm learning! Instead of everyday images and people, abstract art focuses on evoking emotion through shapes, forms, colors, and textures. Read about them, study their art, and then dive in and create your own abstract art. Of course, you can create some great abstract art with markers, pens, or paint, but you can also create abstract sculptures. But instead of modeling clay, try something new - a 3D drawing pen. The best way to learn more about abstract art is to create your own - either by drawing, painting, or sculpting. A 3D pen is a perfect tool for abstract creations. We've been using the AtmosFlare 3D Drawing Pen to create our own abstract sculptures. It's the perfect tool for kids who want to do art projects in a new way - it's very fun! Why AtmosFlare? We have no prior experience with 3D pens and the AtmosFlare 3D pen was perfect for us. It's easy to use, even for kids, with just a simple switch from one color ink to another. The 3D pen is simple to put together - just follow the included instructions for inserting the battery and ink cartridges and you'll be on your way to creating your own 3D abstract art creations in no time! One quick tip - make sure you slide the tab to hold the cartridge in place otherwise it will be more difficult to use. You'll also want to grab some extra ink cartridges - they have 12 different colors, so your kids will have lots of fun with their colorful creations. I suggest starting with drawing on a flat surface so you can get used to holding the pen and drawing with it. Once you feel more confident in your abilities, start drawing in 3D! Use a drawing surface like waxed paper with black construction paper underneath. Create a simple base first (square or circle) for your 3D sculpture. Create your base with the light turned off then turn on the light to cure the ink. Practice with some pencil drawings first to get used to drawing. Take your time - if you are curing your ink as you draw, go slowly, giving it time to harden. You can find videos with more tips at the AtmosFlare website. Have you studied abstract art with your kids? Abstract art is a fun artistic expression for kids to learn about and use. Try some abstract art with a 3D pen!